Published in the South Kent Gazette, 10 June, 1981. “Yet, in the face of such a description, and by those who have seen the machine as well, it is asserted that I pretend to possess knowledge and power which subverts the whole course of nature; and this occult power is said to reside in a spring which I can carry in my pocket. When such silly, ignorant, wilful, malicious assertions are published, only two epithets need be applied to those making them viz: fools and liars. “2nd. In reference to the offer of a certain sum of money for a private trial, and my refusal of it. The real facts of the case are, that long previously I had pledged my word to others elsewhere to grant them the first trial; but, when the above offer was made, X requested, and obtained, permission to accept it (on condition that the money be paid previous to the trial). This condition was refused; therefore I had no alternative but to refuse the offer. “3rd. The former posters, announcing my intended feat, also indicated my intention to visit Berlin previous to it. As soon as I found it impossible to return in time to carry out my announced intentions, I at once wrote to the Dover and several London papers, postponing the feat; therefore, I see no just cause why the postponement should be treated as if it were a complete repudiation of the announcement. "4th. As to my movements in Berlin, the statements which have been published are guesses, perversions and utter falsehoods. I was interviewed by several high Naval and Military officials. I did not demand any money from the authorities for an exhibition. I demanded £1,000 as damages from the directors of Weissensee, for a gross breach of contract in reference to certain arrangements for exhibitions, etc. Both the authorities and the directors of Weissensee have only their own childish fears of ridicule (in case of failure) to blame for not availing themselves of my willingness and fixed appointment to exhibit. This they cannot contradict, as I possess documentary proofs of the truth of my assertion. “However, I did not leave Berlin without giving a private trial; neither has my visit been fruitless: as has been falsely published. A Russian noble has seen the machine in action, and is quite satisfied it is all it is represented to be. He left at once (with full particulars) for St Petersburg, whence he returns to accompany me in the above aerial voyage. More I decline to state, as past recent experience has taught me that falsehood, treachery and ingratitude lurk in most unsuspected quarters; and that there are those who would stoop to anything to thwart and ruin me. “5th. In order that no further quibbling may occur in regard to the terms and conditions on which alone I will treat, I append the following, which are rendered essential by the peculiar circumstances of the case, and by the fact that I am alone in the contest. First — 30 days after receipt of £1,000 sterling, I will give a private exhibition to anyone in the United Kingdom. Second — For £4,000 sterling, I will grant anyone a twentieth of whatever the discovery realises. Third — I will not, and need not, sell the discovery for less than £500,000 sterling. These terms are open for acceptance only before the above aerial voyage. The private trial having suggested two improvements, whereby greater ease and nicety in controlling the machine will be attained, and greater safety ensured, I have deemed it prudent to adopt them; and, therefore, and for the convenience of my fellow voyager, and other personages, the above aerial voyage is fixed for a later date than it otherwise would have been.“ — Ralph Stott, Box No. 10, Post Office, Dover. It is difficult to imagine that many people in Dover stood in front of so wordy a poster and read right through to the end. If they did they must surely have been utterly bewildered long before they reached the part where Mr Stott offered to sell a share in his “discovery.“ If they did not suspect anything crooked about the whole thing they might have been puzzled at the discrepancies between the above and details given in another poster. In September 1876 a poster gave quite different figures for the size of the flying tub—5ft long, 2ft 6in wide, 4ft high and a weight of 300lb. We have no information as to whether the Russian nobleman turned up to join Mr Stott in his enterprise or whether anyone was foolhardy enough to invest in a share of his great discovery! Even today there is hardly a prettier spot in the Dover area than the bridge which spans the Dour at the upper end of the Grabble mill pond. Just above it, on the eastern side, stood the attractive residence of Mr Willsher Mannering, known as River Dale. This became the location of the Dover College junior school after the last war but the site was in recent years developed with high standard homes, some of them overlooking the millpond, forming the development known as Riverdale. The junior school moved to Folkestone. On the western side of Lower Road at its junction and Valley Road Mr Henry W. Thorpe erected a commodious residence. A little further west, in the fields, is a good sized house surrounded by smaller buildings which, until 1835, was the River Union Workhouse for the parishes of Alkham, Capel, Hougham, River, Buckland, Charlton and Whitfield. After the Buckland Union was formed, and the House built in Buckland Bottom, this poor house was out to other uses. In 1841 it seems to have been used for religious services by the Wesleyans. At a little later date the house was transformed Into a high-class school, called Hofwyl College, conducted by Mr Jaspar Weston, L.R.C.P., and Mrs Maria Weston, who held a like diploma. This building, when used as a workhouse, had on the top an additional storey, which was taken off when it became a private residence. To the left, in proceeding towards River village, ran the extension of the Dover tramway, the Dart next Crabble being laid on ballast and fenced like a light railway; but above the old workhouse site it was laid on concrete as a public road up to River church, where it terminated. From the Valley Road, a well laid out 40ft road opened on to the tramway route, and from thence upwards it was properly sewered and kerbed for rows of houses on either side in a very attractive setting. When the trams were withdrawn and buses took over the track was lifted and Lewisham Road was laid out. River School was built midway between what used to be Mr Lewis’s River brickfield and the church, by the River School Board and was later enlarged. There is evidence that at one time the church was used as a village school, the burial register having an entry which states that in 1803 children had tom out pages when the school was in the church. The first permanent school was built in Minnis Lane, next to the old Dublin Man of War public house. Early financial support came from local businessmen such as the Fectors and Phipps. In 1870 the parish passed a motion calling for an elementary school to be built and in 1872 it became a board school with attendance being made compulsory. Two years later the school moved to its present site and by 1877 the number of pupils had passed the 100 mark. By the centenary of the school, in 1974, this number had grown to 380. 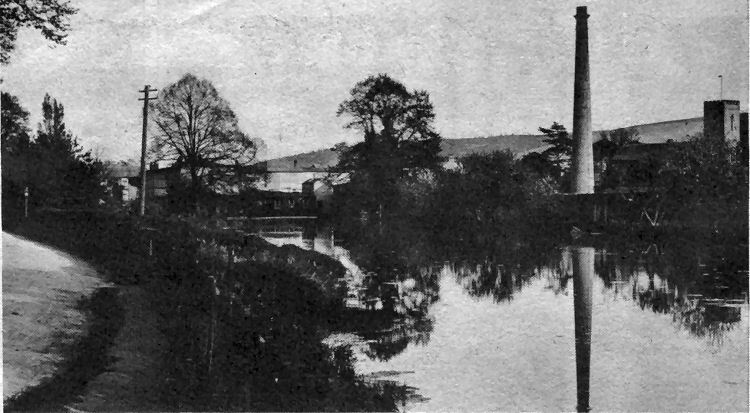 This picture postcard view of River Church and the old River paper mill, in Minnis Lane, with its lofty chimney casting a reflection in the millpond, dates from the early part of this century. The history of paper-making at River dates back over 300 years and for over a century the River mill was in the ownership of one family, the Phipps, two of whom went bankrupt while running: the paper-making business. The mill continued in the name of F. Phipps and Company, however, until 1908 when it was sold. The paper-making plant was finally scrapped at the end of the first world war. 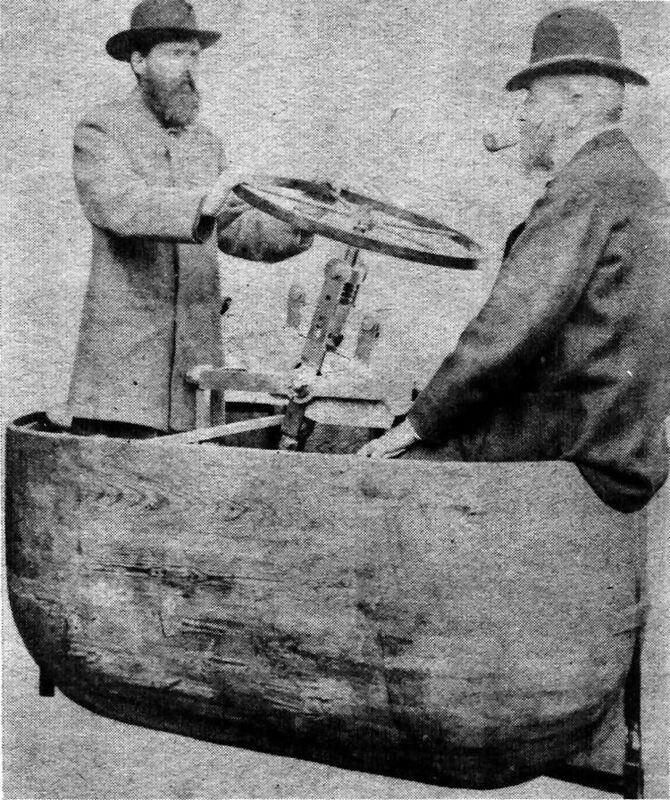 The picture, above, by C. H. Buckman, of Dover, depicts Ralph Stott and a companion in the curious contraption which Stott claimed could fly using a revolutionary new principle he had discovered.